Happy New Year....my how the time has passed. Something happens to me after Halloween. I get into different mode. I start with post-Halloween blues...lasts for a couple of weeks. Christmas goods showed up before the 31st of October. I found it bizarre and annoying. Nothing worse than seeing Halloween being removed before Halloween has even come or gone. Aisles of Halloween items gave way to Christmas items. I guess I shouldn't complain since (it seemed like) Halloween showed up earlier this year. Then Thanksgiving arrives and being thankful for all of the many blessings there are in life. Thanksgiving was terrific this year. And before you know it there's shopping for Christmas, getting set-up for Christmas and then...Christmas. Then there's Christmas clean-up mode (which we just completed) and the whole aftermath. The months of November and December fog over. Right now it all seems a bit hazy. I did get some cool things for Christmas and I hope that you and yours had a wonderful Holiday season! 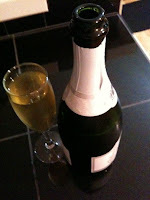 New Year's Eve was relaxed - we had a nice relaxing dinner and a movie. I stayed up with my daughter until midnight. I drank champagne and she had root beer (in a champagne flute!). It wasn't easy for either of us to stay up and she kept nodding off, but she wanted to ring in the New Year with her Daddy so I was OK with it. Our (usual) annual New Year's Day trek was canceled due to health reasons as we thought it better to just stay home and enjoy some family time. I made a bunch of Hoppin' John to bring us some New Year's luck and decided I should bring some over to my Mother and in-laws place (everyone was sick). Hoppin' John is the Southern United States' version of the rice and beans dish traditional throughout the Caribbean. 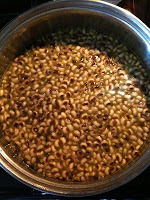 It consists of black-eyed peas and rice, with chopped onion and sliced bacon, seasoned with a bit of salt. Some people substitute ham hock or fatback for the conventional bacon; a few use green peppers or vinegar and spices. Throughout the coastal South, eating Hoppin' John on New Year's Day is thought to bring a prosperous year filled with luck. The peas are symbolic of pennies or coins, and a coin is sometimes added to the pot or left under the dinner bowls. I also brought over some home-made vanilla ice cream I had made to my Mom. I'm going to attempt to get back into the swing of things...like blogging. I'm going to attempt to get my recording groove back as well this year. I have said this for a few years now and each year my studio is dormant. I did get over to see Jay a little this past year, but the plan is to make it as regular a thing as humanly possible. We've got work to do, you know! And I'm not gettin' any younger. Some of you may have already heard this track. It is the latest Rain Station track. It isn't done...no vocals yet, but I am certain we'll remedy that the next time I'm over at Jay's place. I like to put this song on repeat and zone out (often...I'm doing it RIGHT NOW). This song follows the same formula as "Criminal Goat" (as has this entire project so far). Jay recorded the drum tracks and then I came over recorded bass, guitar tracks and keyboards. 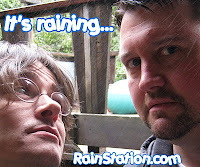 We have fun whenever we get together and this track is classic Rain Station. Enjoy the track and look for more from me (here at Mark Harvey's World) and us (your good friends at Rain Station). Happy New Year! Make it the best year yet!